The SemiHemi™ Breeding Program strives to continue developing the vision of great Peruvian alpaca breeders, while utilizing modern tools to accelerate that effort. Our focus is developing a line of large, well-framed alpacas with excellent conformation and superior fleece traits of uniform, sub-20 micron, 20 pound fleeces. The North American alpaca herd has improved dramatically since the first Peruvian imports in 1993. While there were many amazing alpacas that contributed to that improvement, if there exists one single Huacaya herdsire that had the most profound impact upon improving the overall quality of the alpaca outside of South America, there is no doubt that this alpaca is Peruvian Hemingway. Hemingway's progeny have seen unmatched success in competition and as standing studs around the world. This is due to his ability to pass fineness of fleece, a low coefficient of variation, uniformity, and luster along to children, grandchildren, and even great grandchildren. His is the ideal we strive to further develop as we improve from generation to generation. Now that we have EPDs to more accurately determine a herdsire's impact through progeny testing, we clearly see Hemingway's profound impact throughout the North American herd. Even though we've had over 20 years of breed improvement since his import, he still ranks in the top 1% for 5 traits (and one of the top 50 animals in 4 of those). While no individual alpaca had quite the impact of Hemingway, another notable contributor to the advancement of the North American alpaca herd was the import of animals from Don Julio Barreda's famous Accoyo herd. Renowned for their unmatched density, character of fleece, and crimp, the Accoyo imports generated tremendous excitement and have contributed greatly to the improvements seen in the North American herd quality. Just like Hemingway offspring, the elite fleece and conformation quality of the Accoyo bloodlines have been validated through success in numerous competitions over the years. For six decades, Don Julio Barreda's world famous Accoyo breeding program was focused on improving fineness and uniformity while increasing fleece weight and animal size. Consequently, a hallmark of the Accoyo imports was large bones, heavy fleece weight, and improved fleece characteristics. The well documented Accoyo breeding program has been widely regarded as the best alpaca breeding program in the world, with the worlds greatest alpacas. In 1995 Don Julio Barreda revealed to Mike Safley that he had a new vision for his herd, called 20/20 - "20 pounds of fleece, 20 microns fine, every alpaca, every year". In 2013 Mike returned to Accoyo and randomly picked a 3 year old male that was shorn for 20 lbs of fleece as he watched. One 11 year old male was subsequently shorn with 28 pounds of fleece. History of Accoyos Caligula and Cconchatanca’s Hemingway. 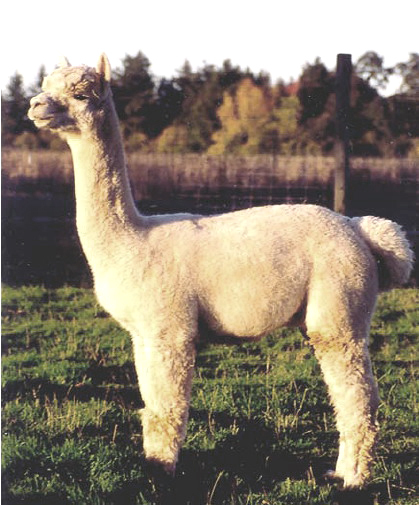 Timberland Alpacas was the first ranch in the United States to develop the Hemiaccoyo bloodline in 1994 with the first breeding of their 1994 Accoyo import female Pperuvian Sara to Hemingway. They discovered that the combination of these two bloodlines yielded amazing results. Timberland describes the characteristics of this marriage as producing "fineness of fleece, wonderful crimp, luster, colors ranging from white, fawn, brown to black, and an ability to hold those characteristics of fleece throughout their productive lives." The improved fleece and conformation of their offspring have been confirmed through continued success in the show-ring. At Apple Mountain Alpacas, we made the decision to deliberately incorporate those unparalleled Hemingway/Accoyo genetics into all our improved bloodlines. Our breeding selections are building upon the greatness they introduced to the North American alpaca herd. With each passing generation, Hemingway/Accoyo bloodlines will be folded into other improved bloodlines we've identified exhibiting elite fleece characteristics that are validated in the show-ring, developing improved versions of the Hemingway/Accoyo line that we call "SemiHemi™" alpacas. Ultimately our goal is to leverage advancements of the North American herd while using advanced breeding tools such as EPDs to continue the efforts of Don Julio Barreda in creating a line of 20/20 alpacas that have 20 lb fleeces of sub-20 micron. Barreda avoided using outside herdsires, that he called "refresadores" (refreshers), because he couldn't validate the quality of genetics in these unknown lines. However, through the use of EPDs we now have a solution to his dilemma. Accoyo avoided using outside herdsires because Don Julio didn't know the "fathers lineage". With the American alpaca DNA-based registry and EPD system, we now know every herdsire's lineage quite well. Guided by EPDs, our goal will be to lock-in traits and create consistency in offspring. We will maintain genetic variability, which increases the odds of greater genetic improvement. While developing these fleece traits, we believe, as did Don Julio, that it's also important to maintain larger alpacas with density of bone and excellent conformation to develop the greatest fleece weights. In an article written by Mike Safley, he mentions that "at Accoyo, each alpaca is first bred for size. Next, the alpaca are selected for their fleece density. Bigger animals with more fleece per square inch produce more fleece per shearing." ... is based on a herdsire that is at least 1/8th Hemingway and 3/8 Accoyo (50% Hemingway/Accoyo). That's where we get the name SemiHemi™. Secondary emphasis on Accoyo (and Caligula) lines to further improve fleece weight while attempting to fold in the best genetics from great American breeding programs. SemiHemi™ is a program initially focused on breeding the greatest herdsire bloodlines from the Peruvian imports to some of the greatest females available today. SemiHemi™ is more than just a pedigree though. Just like at Accoyo, each alpaca is first bred for size. Unlike Accoyo, our next selection criteria is conformation, followed by EPDs, and validation of both through show performance. Improvements will be introduced through foundation females carefully selected for superior fleece traits that have been validated in the show ring. 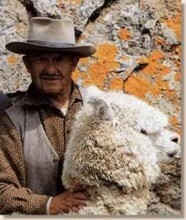 Size Matters: Bigger animals with more fleece per square inch produce more fleece per shearing. EPDs Matter: We are intensely focused on utilizing EPDs to accelerate improvements. The art of breeding can't be reduced to a formula, but we have guidelines to help navigate breeding decisions. SemiHemi's™ are built on not just great sires, but on great dams as well. Both should be heavy boned, with straight topline, and be well proportioned. The FIRST priority in a SemiHemi™ is a large healthy frame with excellent conformation. Just as Don Julio Barreda believed that larger alpacas resulted in greater fleece weight, we carry on that belief and tradition. Uniform fleece focused on sub-20 micron, longer staple, and heavier fleece weight are the primary criteria for selecting SemiHemi™ dams and sires. Secondary criteria would be lower medullation and improved curvature. SemiHemi™ males and females should come from long lines of success in the showring. This helps establish impartial validation of excellent conformation. Dams and sires will preferably be multi-champions, with parents and grandparents that were multi champions as well, locking in positive conformation traits. The real power behind the SemiHemi™ beeding program is locking-in genetic traits, selected through the use of EPDs, and maintenance of genetic variability to increase the odds of genetic improvement. SemiHemi™ males are in the top 1-2% for several traits, and both males and females are typically in the top 5% of the national herd for key traits. Developing a line of large, well-framed alpacas with excellent conformation and superior fleece traits of uniform, sub-20 micron, 20 lb fleeces, with EPDs consistently in the top 1-3% of the national herd and validation in the show ring to back it up. Apple Mountain Alpacas coined the term SemiHemi™ to describe these improved bloodlines. Alpacas that carry the SemiHemi™ designation will not only incorporate the best improvements made in the North American alpaca herd, but are also built on the amazing foundations of a legendary herdsire unmatched to this day, and the world famous Accoyo breeding program. All SemiHemi™ alpacas will share the common lineage of their legendary forefather, while continuing the work of Accoyo's Don Julio Barreda, preserving their legendary past while building toward an exciting future.